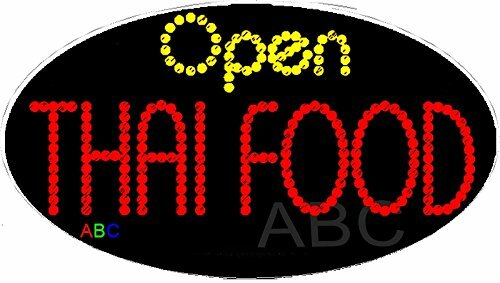 15''x27'' Animated Open Thai Food LED Sign w/Flashing Controller by ABC at Thai City Deals. MPN: 18034406. Hurry! Limited time offer. Offer valid only while supplies last. Built by LED sign experts using individual bright large 8mm LED bulbs inserted into a very attractive black translucent high quality acrylic bard. Built by LED sign experts using individual bright large 8mm LED bulbs inserted into a very attractive black translucent high quality acrylic bard. The LED bulbs are controlled by a built-in flashing controllers, preprogrammed with a number of flashing patterns that are designed to attract attention. The image for this sign shows solid lines and/or solid logo. The actual sign is made with individual LED bulbs and shows as dotted lines and/or logos (see the image of example OPEN sign & actual OPEN sign). The sign comes equipped with a 110V AC U.L or CE listed power supply that plugs into a standard outlet. Our Animated Open Thai Food LED Sign consumes very little electricity, typically 70 to 90 percent less energy than a similar neon sign. It is very easy to install and all the required hanging hardware and chains are included. Flashing & Animated LED Display, Excellent visibility. (including when in direct sunlight), Includes hanging chain, Included a 110V AC Adapter, Animation/Flashing turned on/off is very simple, via a switch. If you have any questions about this product by ABC, contact us by completing and submitting the form below. If you are looking for a specif part number, please include it with your message.